Primary small cell carcinoma of the esophagus (PSCCE) is a rare and aggressive tumor with poor prognosis. The aim of this study was to investigate the existence of EGFR, KRAS, PIK3CA and PTEN mutations in PSCCE. Clinical–pathological data and paraffin-embedded specimens were collected from 38 patients. Exons 18 to 21 of EGFR, KRAS and PIK3CA status were analyzed by real-time PCR based on ARMS and Scorpion technology in all patients, and the PTEN gene was also screened using real-time PCR and high-resolution melting curve analysis (HRMA). Only 1 (2.63%) out of 38 patients had EGFR mutations in L858R missense, and KRAS and PIK3CA were not found in the mutational spot in all patients. However, PTEN mutations presented in 14 (36.84%) out of 38 patients, including exon 5 coding for PTEN missense mutation (n =4, 10.53%), exon 6 (n =7, 18.42%), concurrent exon 5 and exon 6 (n =2, 5.26%), and exon 8 (n =1, 2.63%). Concurrent mutations of these genes were not detected in all samples. No statistically significant associations were found between the clinicopathological features and the mutation status of PTEN. The incidence of PTEN mutations in Chinese patients with PSCCE was higher than that of previous reports in other histological subtypes of esophageal cancer. Primary small cell carcinoma of the esophagus (PSCCE) is a specific histological type of esophageal malignancy and is a rare, aggressive disease with a high metastatic rate and poor outcome. The incidence of PSCCE is reported to be 1–1.5% of all esophageal malignancies  and from 0.05 to 2.4% in western populations , 7.6% in Chinese literature [2, 3]. Several treatment options are available, including surgery, chemotherapy, radiotherapy and concurrent chemo-radiotherapy, but the prognosis remains poor. Hence, it is urgent to explore novel therapeutic modalities for patients with PSCCE. Molecular targeted therapy is one of the new modalities that have emerged in the past decade. An epidermal growth factor receptor (EGFR) has been validated as a promising therapeutic target for cancer. It has been reported that EGFR expression is higher in esophageal cancer cells than in corresponding normal tissue and EGFR mutations have always been found although the incidence is low [4–15]. And whether or not it may be potentially useful targets of therapy for esophageal cancer remains unclear. V-Ki-ras2 Kirsten rat sarcoma viral oncogene homolog (KRAS) is a critical downstream effector of the EGFR pathway. KRAS can harbor oncogenic mutations that yield a constitutively active protein . Recently studies have indicated that the presence of mutant KRAS is favorable to one of the high-risk factors implicated in esophageal squamous cell carcinoma (ESCC) development [17–21]. Mutant Phosphatidylinositol 3-kinase CA (PIK3CA) stimulates the AKT pathway and promotes cell growth in several cancers, including ESCC and Non-small cell lung cancer (NSCLC) being associated in these cases with poor prognosis . Furthermore, PIK3CA mutations were always found in esophageal cancer [23, 24] and further functional analyses of the mutations are warranted to determine whether or not they may be potentially useful targets of therapy for esophageal cancer . Phosphatase and tensin homolog deleted on chromosome 10 (PTEN) mutation is a frequent event in endometrial cancers. Recent reports have demonstrateded that the presence of PTEN mutation is highly predictive in glycogenic acanthosis of the esophagus, and there are mutations in the PTEN gene of the ESCC cells and that the wild type PTEN gene has important effects on the ESCC cells in vitro and in vivo [26, 27]. Whatever, these data suggest that PTEN could be another target gene in esophageal cancer treatment. Mutations in KRAS, PIK3CA and PTEN genes have recently emerged as the potential predictive factors of low/absent response to EGFR-targeted therapy. Given that currently there is a lack of data on gene mutations associated with EGFR, a potential target for PSCCE, except a few case reports which lacks detailed description of the type of esophageal cancer investigated, and the distribution of these genes mutations in PSCCE still remains uncertain, we were motivated to conduct this study. The present study, which to our knowledge is the first in the world on this area, will help to clarify the issues. 38 samples of cancer tissues were obtained from PSCCE patients who underwent endoscopic evaluation with biopsy and esophagectomy at Daping Hospital, Third Military Medical University between October 2007 and June 2012. The age of the patients ranged from 42 to 76 years (median 61.3 years). 31 (81.58%) patients were male and the rest 7(18.42%) were female. The patients were treatment-naive prior to the study. Esophageal biopsies were obtained via endoscopy from the 38 patients and histopathology performed. The cells, forming neoplastic formation in which mitotic figures and intensive squeezed artefacts were found, were round or oval-shaped and having the granular chromatin. The cytoplasm was narrow, and nuclei appeared in different shapes (Figure 1). Immunohistochemical (IHC) assay demonstrated that tumoral cells in over 95% of the 38 samples presenting chromogranin A (CgA), Ki-67, cytokeratin (CK), and synaptophysin (Syn) with a positive immunoreactivity. Immunoreactivity together with thyroid transcription factor-1 (TTF-1) and CD56 were observed positive in about 45% to 65%. All the cases were reported as PSCCE by three independent pathologists with knowledge of clinical data, cytological and IHC examination. The study protocol was in accordance with the ethical guidelines of the 1995 Declaration of Helsinki and was approved by independent ethics committees at Daping Hospital, Third Military Medical University. Written informed consent was obtained from the patient for the publication of this report and any accompanying images. A representative case of primary small cell carcinoma of the esophagus. Biopsy materials were shown in the histopathologic examination, and tumoral cells in the sample indicated CK, CgA, CD56, Syn, TTF-1 and Ki-67 with a positive immunoreactivity by immunohistochemical examination. (Magnification, ×200). Mutation analysis of these genes was performed by extraction of genomic DNA from formalin-fixed, paraffin-embedded tissue slides or sections with the use of the QIAamp DNA FFPE Tissue Kit (Qiagen), according to the manufacturer’s instruction. Tumor DNA was isolated from areas which were selected under light microscopic control by three senior pathologists and which containing at least 70% tumor cells in paraffin-embedded tumor samples. Mutational analysis was performed as described previously . For EGFR mutations analysis, we used the EGFR Scorpions kit (DxS, Manchester, UK), which combines Scorpions amplification refractory mutation system (ARMS) and Scorpions technology, to detect mutations in Real-time Polymerase Chain Reaction (PCR) reactions. Mutant KRAS in exon 2 was detected using a validated KRAS mutation kit (DxS, Manchester, UK) that identifies seven somatic mutations located in codons 12 and 13 using allele-specific Real-Time PCR. PIK3CA mutations in exons 9 and 20 were detected using a validated PIK3CA mutation kit (DxS, Manchester, UK) that identifies three somatic mutations (H1047R, E542 and E545) by Real-Time PCR based on ARMS and Scorpion technology. All the analysis of these genes mutations were performed in an ABI Prism 7700 sequence detector (Applied Biosystems). SDS2.0 software (Applied Biosystems) was performed for data analysis according to the manufacturer’s instructions. Each sample was analyzed in triplicate or duplicate. PTEN mutations in exons 5, 6 and 8 were evaluated using a method previously published . High-resolution melting analysis(HRMA) was performed on genomic DNA prepared from scraped paraffin slides. Two round PCR was done using 6 primer sets covering three exons of the PTEN gene. The following primer sets for Exon 5 were used: PTEN-F (forward) 5′ACC TGT TAA GTT TGT ATG CAA C3′, PTEN-R (reverse) 3′TCC AGG AAG AGG AAA GGA AA5′, Exon 6, PTEN-F 5′CAT AGC AAT TTA GTG AAA TAA CT3′; PTEN-R 3′GAT ATG GTT AAG AAA ACT GTT C5′, Exon 8, PTEN-F 5′CTC AGA TTG CCT TAT AAT AGT C3′; PTEN-R 3′TCA TGT TAC TGC TAC GTA AAC5′. All exons were amplified with the following PCR conditions: pretreatment at 94°C for 4 minutes, 35 cycles of amplification, and a single 10 minute final extension procedure. Each of these 35 cycles consisted of a denaturing step at 94°C for 1 minute, an annealing step of one minute (54°C for exons 5 and 8; and 53°C for exons 6), and an extension step at 72°C for 1 minute. After the final extension, an additional denaturation step at 95°C for 30 s was carried out. Subsequently, the PCR products were briefly centrifuged and were used directly for high-resolution melting using the LightScanner® instrument (Idaho Technology, Inc.). LightScanner® analytical software with Call-IT™ 2.0 (Idaho Technology, Inc.) was performed for data analysis according to the manufacturer’s instructions. All HRM assays were replicated two to three times for each sample. All the data were processed using SPSS13.0 software. Chi-square (X 2 ) test was performed to assess the significance of the association between PTEN mutations and other clinical pathologic characteristics, e.g. gender, age (<60 vs. ≥60), tumor location (upper vs. middle vs. lower third), and TNM stage (cI vs. cIIa-cIIb vs.cIII). All P-values < 0.05 were considered as statistically significant. The presence of EGFR, KRAS, PIK3CA and PTEN mutations in 38 patients were listed in Table 1. Each patient was represented only once, where for each type of material the information from all the patient’s samples was merged. An EGFR mutation was identified in 1(2.63%) of the 38 PSCCE patients, resulting in L858R missense mutation in exon 21. No mutation was found in exons 18,19 and 20. We either did not found KRAS mutations in codons 12, 13 and PIK3CA mutations in exon 9 (E542/E545) and exon 20 (H1047R) in all samples. PTEN mutations were detected in 14(36.84%) out of 38 patients (Figure 2), including exon 5 coding for PTEN missense mutation (n =4, 10.53%), exon 6 (n =7, 18.42%), concurrent exon 5 and exon 6 (n =2, 5.26%), and exon 8 (n =1, 2.63%). No concurrent mutations of these genes were detected in all samples. Moreover, there were no significant associations between PTEN mutations and clinical pathologic characteristics, e.g. gender, age, tumor location and TNM stage (Table 2). 2 patients also mutated in both Exon 5 and Exon 6 for PTEN. 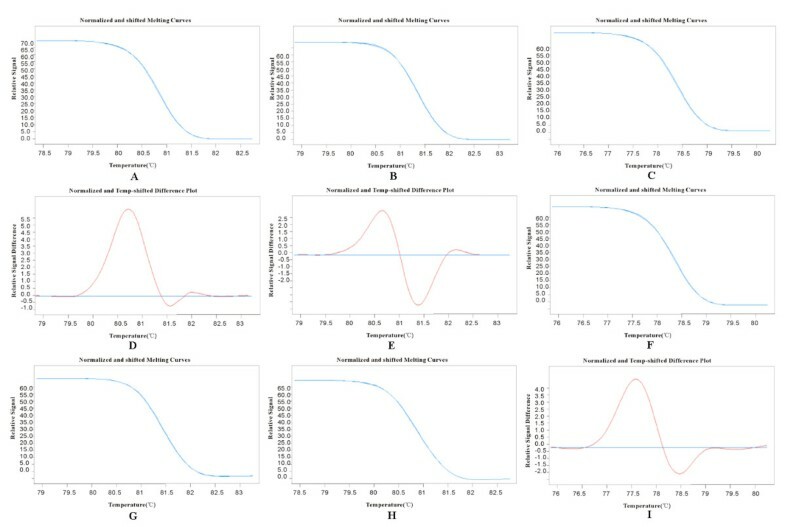 Amplification plots for PTEN mutations in exon 5,6,8 using High-resolution melting analysis. (A,B,C). 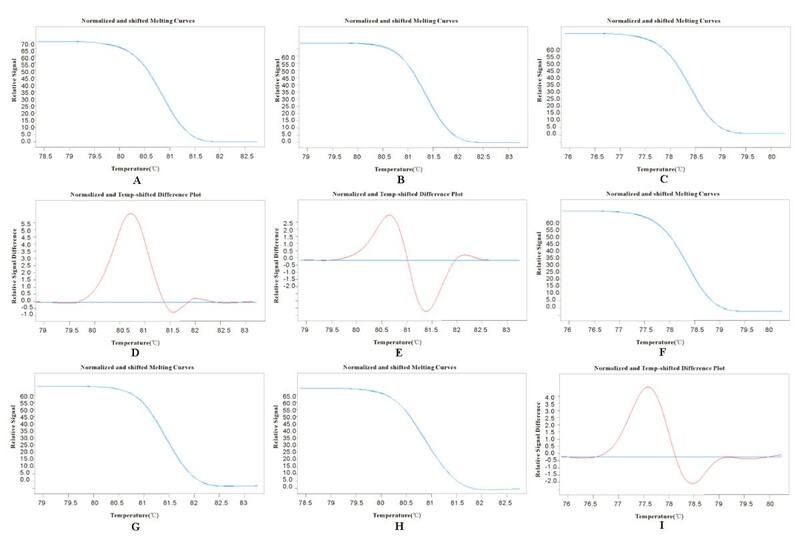 Amplification plots for a sample containing no mutated in PTEN gene. A, exon 5; B, exon 6; C, exon 8. (D,E,F). Amplification plots for a sample containing mutated exon 5 and exon 6 in PTEN gene. D, exon 5; E, exon 6; F, exon 8. (G,H,I). Amplification plots for a sample containing a mutated exon 8 in PTEN gene. G, exon 5; H, exon 6; I, exon 8. The Y-axis shows the relative fluorescence for a measurement of the change in fluorescent signal versus a passive reference signal, X-axis shows the temperature (°C). Each sample was analyzed in triplicate or duplicate. TNM stage: The AJCC (6th edition) was used for staging. Abbreviations: c, clinical. P-values < 0.05 were considered as statistically significant. China is an endemic region for esophageal cancers. The incidence has been reported as165–200/100,000 in China, Japan and Eastern Turkey, while it is only 3/100,000 in Europe and USA . Recently many published reports have demonstrated that EGFR mutations were detected in EC cell lines and patients with EC (Table 3). A phase II study of advanced EC treatment by gefitinib indicated that patients with ESCC had a higher disease control rate . Another phase II trial using gefitinib in advanced EAC showed that gefitinib (500 mg/d) were an active and generally well-tolerated treatment for EAC . However, whether similar results exist in patients with PSCCE remains unclear. To date, the mutation status of EGFR and EGFR related genes in patients with PSCCE have not been reported because of the rare incidence of the specific histological type of esophageal cancer worldwide. In fact, the reported incidence of PSCCE among all esophageal malignancies is higher in Chinese population than in Caucasians . In this study, we found that only 2.63% of 38 patients with PSCCE carring EGFR mutations, consistent with data that reported in the previous studies on other histological types of EC [9, 14, 24], but significantly different from other reports (Table 3) . Possible reasons for the discrepancy are that ethnic differences in the distribution of the EGFR mutations in EC may exist, and the sensitivity of technique used for mutation detection differs. Furthermore, the only one patient with PSCCE identified for EGFR mutation was L858R missense mutation in exon 21, termed as gefitinib-associated mutations. This suggests the gefitinib-based small molecular target therapy possibly can be appropriately applied in treating PSCCE patients that harbor this specific mutation as well. BAC, Barrett’s adenocarcinomas; EAC, esophageal adenocarcinoma; EC, esophageal carcinoma; EGFR, epidermal growth factor receptor; ESCC, esophageal squamous cell carcinoma; NR, not reported; KRAS, V-Ki-ras2 Kirsten rat sarcoma viral oncogene homolog; PIK3CA , Phosphatidylinositol 3-kinase CA; PTEN, Phosphatase and tensin homologue deleted on chromosome 10. EGFR is a transmembrane tyrosine kinase receptor that, on ligand binding, triggers two main signaling pathways. These include the RAS-RAF-MAPK mainly involved in cell proliferation, and the PI3K/PTEN/AKT signaling pathway, mainly involved in cell survival and motility-invasion. In our study, KRAS mutations in codons 12 and 13 were not involved in PSCCE. Although published reports have shown the mutations of KRAS were always detected in the EC (Table 3), the incidence varied among different histological subtypes . These findings indicated that KRAS mutations are a rare event in the carcinogenesis of PSCCE and tumorigenic effects of KRAS gene are histology specific in EC. In terms of therapeutic implications, this also suggests that PSCCE patients with mutated KRAS should gain little or no benefit from RAS-targeted therapy. In addition to KRAS, the EGF receptor also activates the PI3K/PTEN/AKT signaling pathway. The latter can be oncogenically deregulated either by activating mutations in the PIK3CA or by inactivation of the PTEN phosphatase. The PIK3CA gene encodes the p110α catalytic subunit of PI3K that regulates the PI3K/AKT pathways, known to play a critical role in cancer onset and progression. A novel candidate tumor suppressor gene, PTEN gene, known as another effector of PI3K/PTEN/AKT pathway, is always lost by mutations, deletions or promoter methylation silencing at high frequency in many primary and metastatic human cancers, which are important mechanisms for cell cycle progression, survival, metabolism and migration. In this study, PIK3CA mutations in exons 9, 20 did not occur in PSCCE, but 36.84% (14 of 38 patients) of the PSCCE samples were found harboring PTEN mutations. These findings indicate that PIK3CA/PTEN/AKT pathway may be an important pathway for effect in response of EGFR targeted therapy in PSCCE, and the mainly target effector is not PIK3CA but PTEN. PTEN mutations have been identified in numerous human malignancies, including brain, ovary and prostate cancers, but they are rarely seen in carcinomas arising from the head and neck region (including esophagus) [26–28]. Hu et al. reported a mutation incidence of only 3.03% in 33 ESCCs  and no mutations were detected in the hot spot exon 5 (Table 3). In contrast, a recently study reported by Hou et al. found high-mutations incidence of PTEN in three cells of ESCC and that the elevated expression level of the wild type PTEN gene in ESCC cells may increase the sensitivity of the cancer cells to chemotherapeutic drugs (Table 3). Interestingly, 36.84% of the PSCCE samples were found harboring PTEN mutations, much higher than the incidence reported previously in ESCC and other tumors. Explanations for the difference include: (1) High-resolution melting (HRM) analysis might be more sensitive than direct sequencing. (2) Mutation of PTEN gene may be the most frequent molecular event in PSCCE. Although the significance of this mutation remains uncertain nowadays, it is likely to play a major role in the carcinogenesis of PSCCE. This is because the mutation is in the sequence encoding the putative phosphatase domain and the hot spots, including exon 5 (10.53%), exon 6 (18.42%), concurrent exon 5 and exon 6 (5.26%), and exon 8 (n =1, 2.63%). However, whether these mutations in the intron affects transcriptional or post-transcriptional modulation is still to be elucidated, and their relevance for EGFR targeted therapy in PSCCE have not been investigated thus far. Accordingly, further functional analyses of the PI3K/PTEN/AKT pathway in PSCCE are warranted to determine whether or not they may be potentially useful targets of therapy for PSCCE. In the present study, we did not find any significant correlations between the clinicopathological features and the mutation status of PTEN (Table 2), which may be partly due to the relatively small sample size. Larger studies are needed to draw a firm conclusion on these issues. Nevertheless, we invoke caution as there are some caveats involved in this study. First, the data presented here, such as treatment details, survival, and disease control are not enough to draw firm conclusions about whether the mutations of these genes can serve as a molecular classifier that correlates with TKIs responsiveness in PSCCE and, therefore, further studies involving larger studies will be required for an in-depth analysis. Next, our work, even though interested in providing evidence for a newly found high incidence of PTEN mutation in PSCCE, is rather preliminary at this stage and a detailed characterization of the molecular mechanisms involved is required further experimental data for better understanding the functional role and significance of PTEN mutation in PSCCE. Our study is the first report of mutational analysis of EGFR, KRAS, PIK3CA and PTEN in a number of patients with PSCCE. These results have indicated that a high-incidence of PTEN mutation other than EGFR, KRAS or PIK3CA mutations in PSCCE. This suggests that PTEN is a potential target for PSCCE in the future. Furthermore, EGFR mutations in PSCCE are rare but do exist, especially gefitinib associated mutations such as L858R, therefore gefitinib-based gene targeted therapy at EGFR but not KRAS and PIK3CA genes, probably should be included in this carcinoma treatment regimens for patients harboring L858R mutation. Zhimin Zhang, Hualiang Xiao contributed equally to this work. WG conception and design of research; ZZM carried out the molecular genetic studies and drafted the manuscript. XHL helped with sample acquisition and performed experiments. XF, CC and XH analyzed data, ZH, YZZ, WD and LZP conceived the study. ZZM and WG edited and revised manuscript; ZZM, XHL and WG approved final version of manuscript; All authors read and approved the final manuscript.